I’ve been a little worried about being able to pull this door off without screwing it up, but so far, so good. I got several hours logged in the shop today, and the door is looking mostly complete. What makes this hard? I’m glad you asked. The first complication is the glass channel on the back. That means the ends of the rails have stepped tenons on the to work with the rebate for the stained glass panel that will go in the door. That’s not overly concerning, I had to do the same thing on the “Brydcliffish” cabinet, and the came out great. No, the tricky part is the asymmetrical mullion and muntins. I started by milling the rails and stiles. 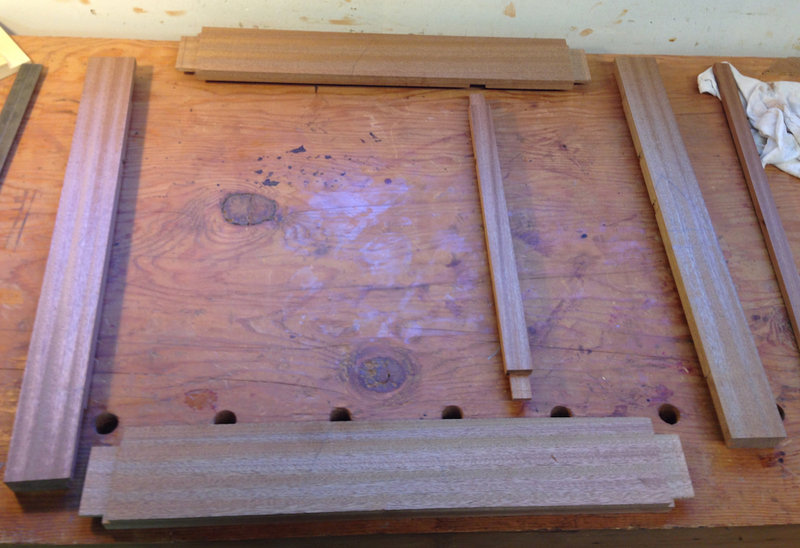 They are all 1″ thick, which means I can put a 1/4″ mortise right in the center, and have 3/8″ on each side. I did the mortises with my spiffy new mortiser, holy cow did that save me a lot of time. I almost feel guilty, shouldn’t I be chopping those by hand? As penance I’ll do a batch of mortises by hand. 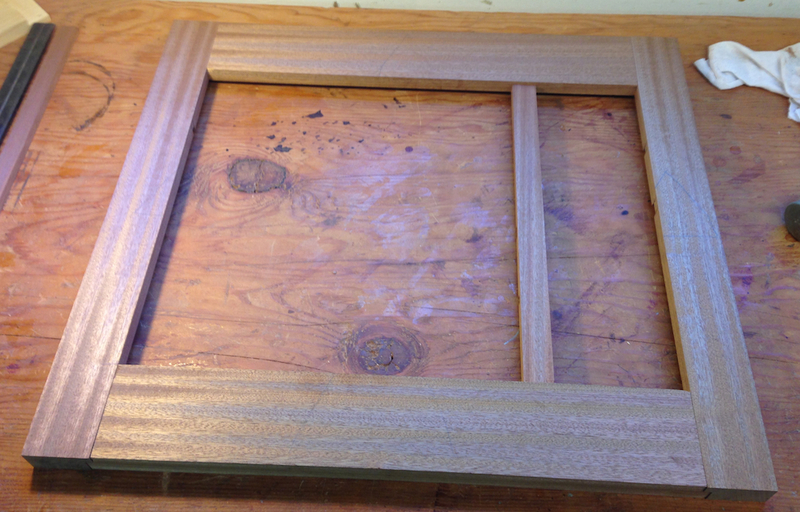 That said, chopping a 1/4″ x 1/4″ mortise 1″ deep would be a trick to do by hand. 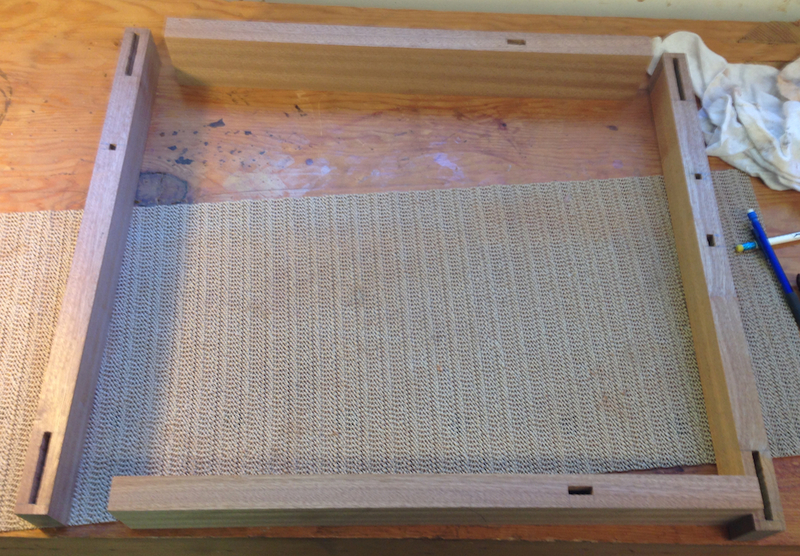 Then I cut the rebate for the class, 3/8″ wide and 1/4″ deep. The side of the rebate should just hit the edge of the mortise. Then I cut the staggered tenons and test fit it the door frame. 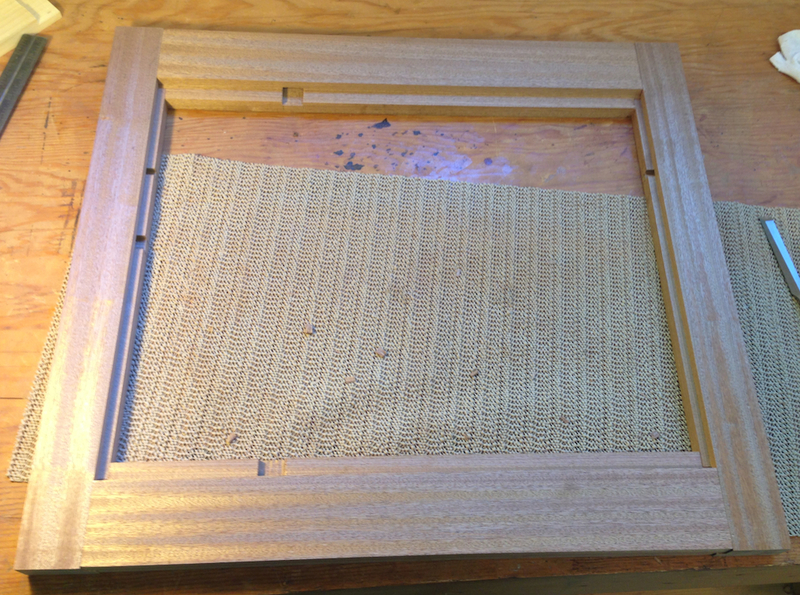 The tenons are all a decent fit, one could be a little snugger but it holds together so it should glue up just fine. A view of the back shows the glass channel and the exposed mortises. If you look closely you’ll notice the the rebate is wider on the stiles. That because the rails get a “cloud lift” detail cut into them, so part of the channel will be removed. Next I made the mullion. The mullion is only 7/8″ thick, set back from the outer face of the door by 1/8″ — so it’s flush on the back. It has rebates on both back edges — the glass in the door is actually two panels, separated by the muntin. The mullion also has a through mortise an a blind mortise for the muntins. When the sawdust settled I had a nicely fitting mullion. 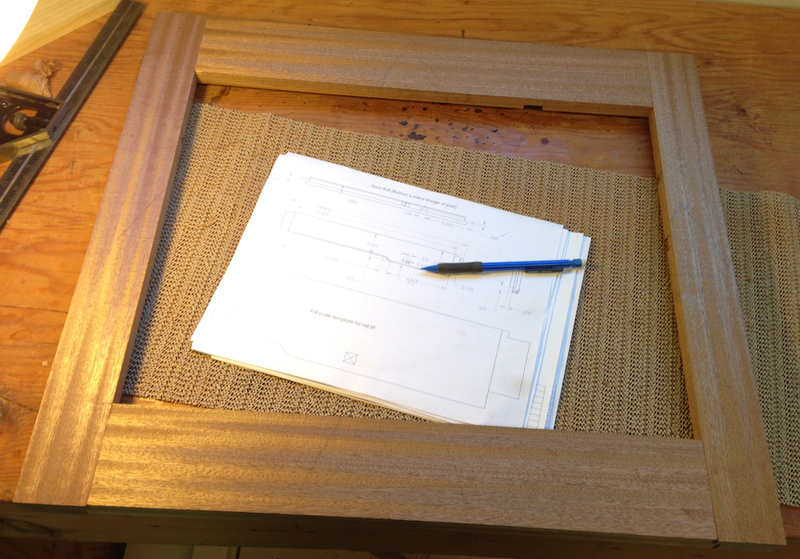 (before the door is finished the inside edges of the frame, and the edges of all the crossbars will be a 1/8″ round over. Of course the mullion has staggered tenon ends too, to work with the rebate on the back. Finally I started on the muntins. I cut extra materials because I was concerned I’d have troubles, and I did make a mistake on the first cloud lift muntin, but the second attempt came out perfect. The short muntin on the right is 1/16″ too short, so I’ll need to remake it. And there is one more muntin that goes below it. All of the muntins are only 1/4″ thick. 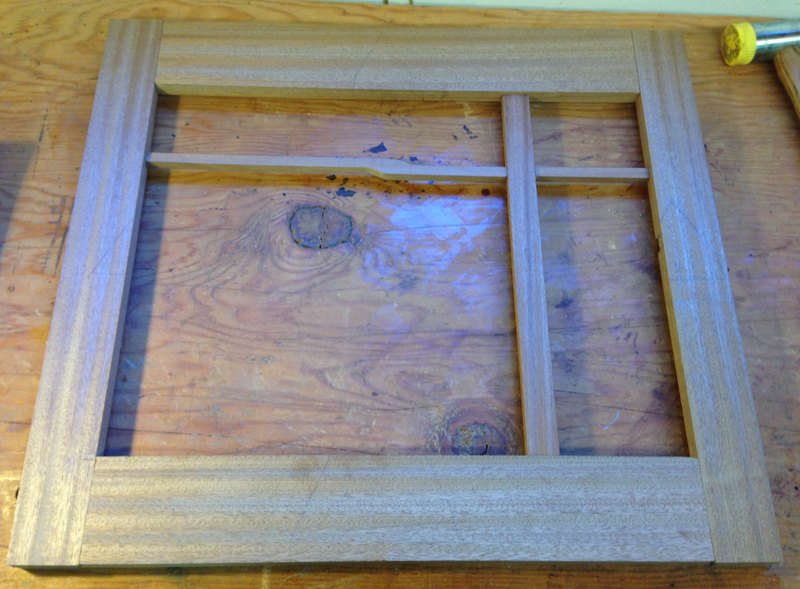 They are set back 1/8″ from the mullion, and the glass will be immediately behind them. Muntins being fit, I need to re-make the short one on the right, and make one more that fits just below it. Tomorrow I need to make the two short muntins, then cut the cloud lift detail in the rails and round over all of the edges. Followed by a healthy dose of sanding. Oh, and make 12 small mortises for the ebony plugs. I really wish I’d ordered those square chisels from Lee Valley last week, it would really simplify that job. Then I should be able to glue up the door. Fingers crossed.